Postcards made from recycled greeting cards. 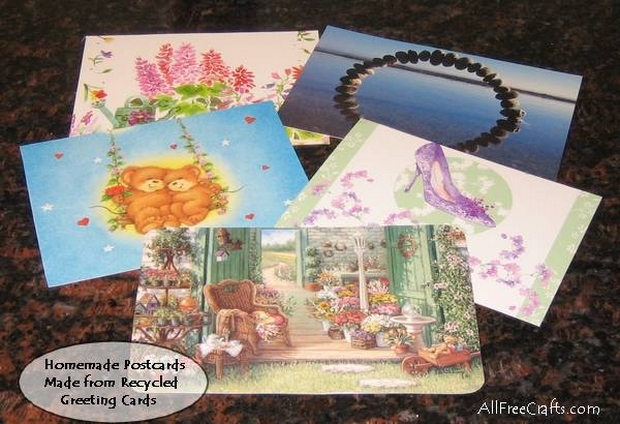 Recycle birthday cards, Valentine cards and other special occasion cards to make beautiful and personal postcards for quick little notes to friends. In a time of instant messaging, texting, and emails, the personal art of letter writing is fast becoming lost. Twenty years ago, I wrote an article for Modern Woman on this topic, never realizing then how prophetic it would be. I love how the internet has expanded our world and made possible friendships that span nations, but I still miss personal letters – both writing and receiving them. 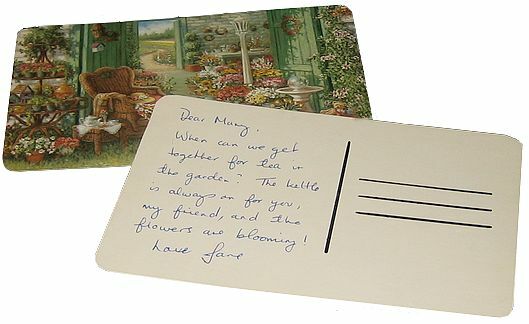 So, although a postcard isn’t the same as a letter, nor as immediate as a Tweet, it has a new role in modern communications. It takes little time to write, yet discovering a postcard in the letter box, amid the shuffle of ads, bills and flyers, is like discovering a diamond twinkling among the coal. Save your favorite greeting cards from birthdays, Valentine’s Day, Easter or other occasions, then turn some of them into postcards. At it’s simplest, all you need do is cut the front of the greeting card into postcard size, then flip over to the blank side and write your note on the left side and the address on the right. Back of a homemade postcard with a note on the left, a vertical line near the center, and three horizontal lines for the address. I like to place a straight vertical line just to the right of the center (so I have more room to write on the left), then three horizontal lines on the right for the address. I leave ample margins all around with a generous margin around the address area as well. This helps automated equipment to read the address accurately and process mail quickly. If you are making a lot of postcards, or are teaching a lot of students how to do so, then you should check the minimum and maximum postcard measurements for your country; if you conform to the standard, the postage is usually a little less than letter rates but will be delivered just as fast. Instructables has a great tutorial on creating homemade postcards which includes making a nifty postcard sizing tool. This plastic template enables you to measure off and draw the postcard on top of cereal boxes, other recycled card stock and, of course, greeting cards. 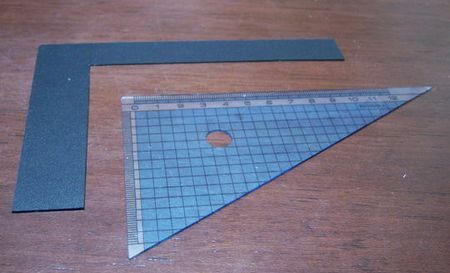 The nominal measurements on the inside angle are 3.25″ x 5″, representing the minimum recommended dimensions in the United States, while the outside angle represents the maximum dimension of 4.25″ x 6″. Royal Mail – Sending Personal Mail in the U.K. Most welcome, Darla. Thanks for the feedback.